During Summer months the Beach House on the lake offers everything from hot dogs-pizza- smoothies and sodas. Located close to Heavenly and the casinos serving boutiful portions in a fun atmosphere. Open Sun-Thu 1100am-0900pm and Fri-Sat 1100am-1000pm. Lakefront dining all year round with floor-to-ceiling views serving American cuisine. Open daily 1100am-1100pm. Delicious pancakes and Swiss-themed breakfast. Adjacent to the resort. Open 0700am-0200pm. Breathtaking views from the Lakeshore Room. 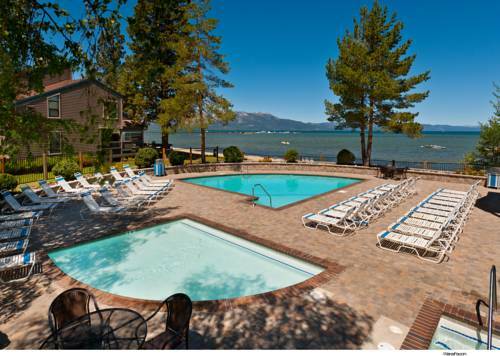 Breathtaking views from the Lakeshore Room and tented Pavilion Deck located just steps from the shore of Lake Tahoe.